Victoria Martin is known to many as, The One Who Sings. This title was given to Victoria at the tender age of six, All through preschool & Kindergarten, Victoria would sing jingles & songs she heard on the radio & T.V. Commercials. She LOVED to sing. Victoria was encouraged to sing by her grandmother Daisy and her Aunt Marie. Victoria would sing for anyone without even an ounce of intimidation. She began singing in church & states her favorite songs are spiritual church Songs. Victoria was always seen smiling. This began the development of a beautiful personality and a talented Singer. Even as a child, Victoria had a strong, sharp voice. Her style began to develop as a young girl. The strength, the tone, and distinctive growl-like sound was described by many as a SOUL STIRRING VOICE. These characteristics made her voice stand out and be appreciated by many. MUSIC WAS TO BE THE PATH VICTORIA WAS DESTINED FOR!!!! With a beautiful smile, By the AGE of 17…. Victoria found out what it was like to HAVE FANS!!!! She entered many local talent shows, after winning them Unanimously, she then began to make her mark. It was then, Victoria realized the power in her voice. She had the ability to make people cry, smile and even win the hearts with her VOICE! Soon Many requests came pouring in for her to make special appearances in many programs, cable shows, Fashion shows and Comedy shows etc. 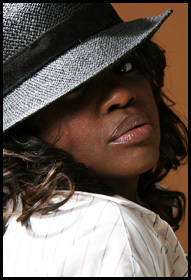 It was not long after, she began travelling locally and out of state SINGING AND MAKING A BIG NOISE IN THE INDUSTRY !!!! Victoria continues to achieve Wonderful things as a singer, a Writer and a performer. This Brown skin, Soul stirring, 4’11, song perfecting bomb shell CAN NOT BE ignored. Victoria continues to make a BIG mark on the industry and is DESTINED FOR GREATNESS!!! As her fan base continues to grow, Victoria has committed herself to making GOOD music for all to love and enjoy.